The scope of this project involved constructing a multi-layered cap over an existing landfill surface. The cap was the final measure our client needed to take in order to ensure the landfill materials remain contained long term and reduce surface water infiltration through the waste. Prior to constructing the cap, the landfill surface was cleared and grubbed of vegetation, a temporary access road was constructed to allow equipment and materials to be brought on-site, and we implemented strict erosion control measures to be maintained throughout the course of the project. 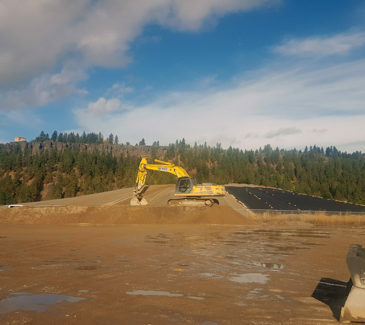 The existing surface of the landfill was graded by cutting and filling to desired elevations to promote drainage and provide a sub-base or foundation for the low-permeability and topsoil layer of the cap. The multi-layered cap was constructed with two low-permeability layers, a drainage layer to serve as a biological barrier and promote runoff, and an 18-inch thick layer of topsoil that was vegetated with natural grasses. The existing drainage ditches and swales were modified to ensure the proper drainage of surface water. A suitable fill material was imported, placed, and compacted to complete the foundation layer. The low-permeability HDPE layer was placed on the foundation layer, and covered with a 6-inch gravel drainage layer. The drainage layer was covered with clean soil meeting the design criteria, and seeded with native grass species. Once the material was distributed, it was compacted and spot density checks were performed to ensure compacted materials met compliance with the specifications. The project was completed ahead of schedule and within budget. 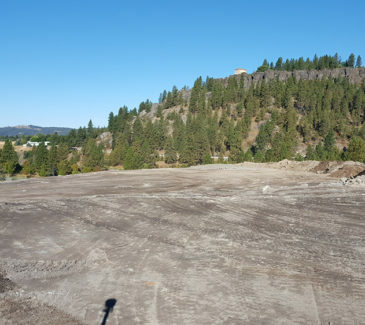 AEC was chosen through a value-based proposal effort to perform a large remedial construction project in Spokane Valley, WA. Our client and their design engineer awarded the project to AEC due to our favorable business relationship, cost-effectiveness, a detailed work approach, and most importantly — our safety record! 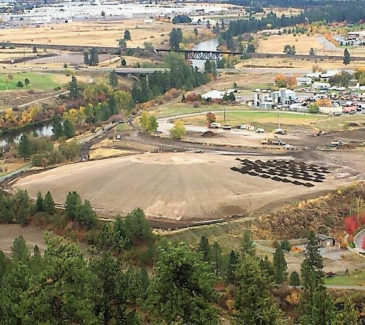 The scope involved excavating, transporting, consolidating and capping of Cement Kiln Dust (CKD) material, which was in direct proximity to residential areas, the Spokane River, and a well-trafficked walking trail. The CKD was transported from multiple locations around the property and capped to prevent further exposure. Our crew and safety personnel took extreme precautions to mitigate hazards such as excess airborne kiln dust in order to prevent our employees and the neighboring community from being harmed. We sent approximately 3,800 tons of contaminated arsenic and lead waste material offsite for disposal. During the performance of the project, thousands of yards of unanticipated large concrete block and debris were encountered, which required additional quantities of borrow material to be imported for backfill and also required AEC to manage additional disposal. 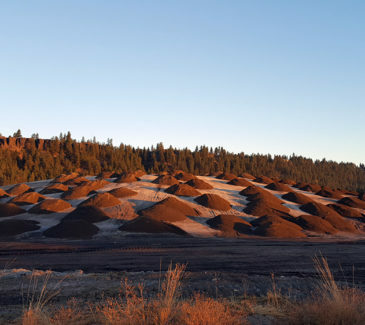 In all, we imported 8,131 tons of bedding sand and 8,618 tons of topsoil. The crew also finish graded approximately 250,000 square feet prior to hydroseeding and project closeout.